How do students upload an image to use in their program? 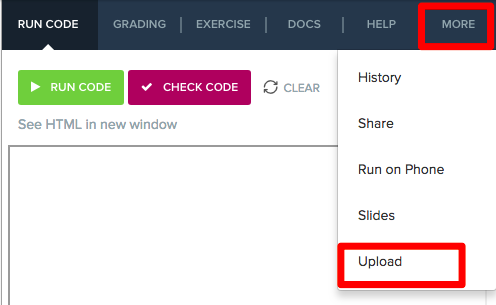 Students can now upload files to their html or JS programs on CodeHS. Students can now upload images from their computer to add to their html pages or JS graphics programs. 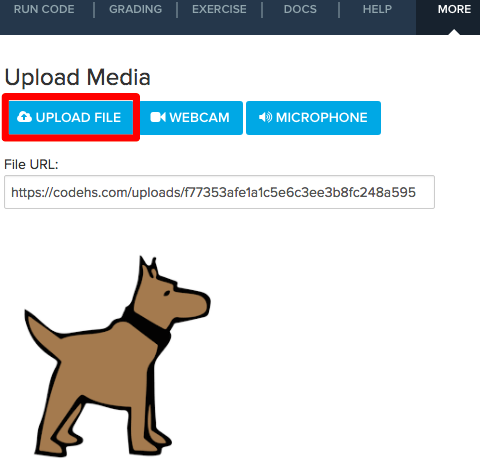 In order to upload an image, the student first needs to go to the program they are writing in the CodeHS code editor and click on the "More" tab. From the "More" tab, the student should select "Upload." After selecting Upload, the student will see this page and will have the option to upload a file. Students can then use File URL and can add that to the their program to have the image appear. You can see here that I've copied the File URL above and added as the URL for my img tag. For html programs, you can use URLs from other sites on the internet. However for JS you need a codehs.com url to use in WebImage and Audio variables.